If there is one thing that's clear to the naked eye and the naked mind, the case of missing Madeleine McCann has been privileged to unprecedented support and protection by the UK establishment. By careful observation and acceptance of evidence in the public domain, this simple fact can't be denied unless the observer is in denial or will not accept the compelling evidence for whatever reasons, reasons best known to themselves I hasten to add. Well I, like so many others who relentlessly probe this case looking for the missing piece of the jigsaw, will not tolerate such injustice in the name of a little three year old child without a voice. People who genuinely care about little Madeleine McCann are here year in year out wanting answers to explain why the case hasn't been satisfactorily resolved - why the people with the means fail to persue the end but instead deny little Madeleine the justice she so richly deserves. Madeleine and Madeleine alone is the victim - she is the only person who matters in the minds of good decent people. 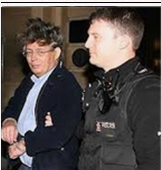 This thread has been initiated to highlight the many high and low profile UK establishment representatives who have willingly and energetically sold their soul to the devil in support of the prime suspects of a heinous crime, in preference to supporting the victim - Madeleine McCann. This sad occurrence cannot and will not go unnoticed, at least not here on CMoMM. 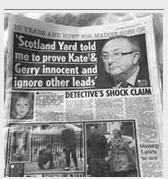 Much of the anticipated information will already be somewhere on the forum but it's important to collate it all into one place in order to reveal the full extent of the so far unexplained support of Gerry and Kate McCann. It is a reference thread only which will be expanded as and when, until all persons of interest have been exposed - if ever. Should members wish to comment on any one entry here, please feel free to copy and paste on the forum's debate section. What better place to start than the recorded words of the former chief of the Metropolitan Police - Sir Bernard Hogan Howe, broadcast on LBC radio in April 2016..
Nick Ferrari (host): Oh yes. Caller: ...what chances can we find this girl? Nick Ferrari: This is I think another additional 95,000 pounds that has been earmarked by the Home Office, I think, for Scotland Yard Sir Bernard, and that would mean around six months the investigations can continue. Nick Ferrari: What do thirty people do all day Commissioner? Nick Ferrari: It takes thirty officers?! 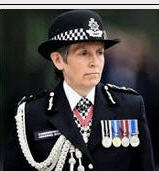 Sir Bernard Hogan-Howe: Well, err, yep, but just bear in mind what happened there, so you got thousands of pages, I went in to one of our police stations back in 2011 and there was a whole room full of documents that this inquiry had produced, you know, from the hundreds of witnesses statements, to all every card they checked out, from all, you know, these inquiries for those who don't get involved in them don't realize just what they generate, huge amounts of material, and of course, these all have to be translated. Sir Bernard Hogan-Howe: This didn't start out in English. Sir Bernard Hogan-Howe: They were translated into English. Nick Ferrari: Have you moved forward in any way? Sir Bernard Hogan-Howe: I, well, that's what I'm indicating, is that first of all we had to extinguish the possibilities that existed in terms of inquiry, I think some of those have been stopped and there is a line of inquiry I think is, well, everybody agrees, is worthwhile pursuing. Nick Ferrari: How long will this go on? When will you finally be prepared to stand down operation, I think it's Operation Grange, isn't it? Sir Bernard Hogan-Howe: Well, really at the moment it will be the conclusion of this line of inquiry, unless something else comes up. Nick Ferrari: So, you'd spend more money, again? Another 95,000 pound? Sir Bernard Hogan-Howe: Well, if somebody comes to me, if somebody comes forward and gives good evidence we'll follow it. Sir Bernard Hogan-Howe: We always say that, ahm, you know, a missing child inquiry is never closed. Nick Ferrari: Yes, but there are a hundred eighty-seven missing children in Britain, not all fortunately of the circumstances of Madeleine McCann. How come this one attracts so much attention and indeed funding? Sir Bernard Hogan-Howe: Well, of course, you know, this was a decision of the government, that in this case they wanted to fund the Metropolitan Police to make this inquiry. If you remember, of course, this poor girl came from Leicestershire area, and was obviously aboard in Portugal at the time. So, we went, the Home Office, the government asked the Met to get involved and we have done our best as anybody humanly can, to try and find this girl, and that's surely the thing that drives us all. Newspapers have got involved, private investigators got involved..
Nick Ferrari: So, you don't see any standing down in the near future of Operation Grange? Sir Bernard Hogan-Howe: Well, I thought it was clear, which is first of all, the line of inquiry that is being pursued, that obviously is important, it's important in the coming months that is resolved and I think it will be, if something new comes forward of course we'll investigate it, but that line of inquiry probably is, at the moment, is the conclusion of this inquiry. Commissioner of the Metropolitan Police, Sir Bernard Hogan-Howe, discusses progress in the Madeleine McCann case. Nicky Campbell: Errm... Adeal in London... no, I tell you what, we'll go to a caller in Cardiff. Brief points please because there's only eight minutes left, so make your questions as... as, errr... well edited as you can. Hi. Caller: (phone in) Good morning. Good morning, Sir Bernard. Sir Bernard Hogan-Howe: Good morning. Caller: I'd like to ask you, errr... on the progress of Operation Grange. Nicky Campbell: Operation Grange, just...? Caller: It's the investigation into the disappearance of Madeleine McCann. Sir Bernard Hogan-Howe: ...but we do have a lot of Operations in London, so I'm sorry if I didn't recognise it immediately. Nicky Campbell: The Portuguese police really mess... really messed up, didn't they? Sir Bernard Hogan-Howe: Errm... I'm not going to respond to Nicky's comments. Caller: (in background) Did they Nicky? Sir Bernard Hogan-Howe: I'm just going to... Let me just... let me just help. Where we are at the moment: We've sent three letters of request for international assistance to the Portuguese, errr... Judiciary, because that's the way their system works, and also with the police - we are working closely with them. Errm... obviously the Portuguese police have got a line of inquiry which is different to the Metropolitan Police's but we're working together to try and resolve that. Errm... we're trying our best to keep the family informed and I think in the middle of all this, quite often their torment gets lost. Have they lost a child or, errr... by being murdered or... sadly... or have they lost a child by someone else stealing them. Nicky Campbell: Do you have suspects? Sir Bernard Hogan-Howe: Errr... yes, we've said very clearly that, you know, we've got lines of inquiry that, errm... are different to the Portuguese police and we're working with them to try and resolve that and I'm only going to... you know, that comment you made at the beginning, about, you know, what they did or didn't do. We've got to work together on this and I don't mean that as a naïve thing; I just think, generally. We've generally got to work together. We can't police Portugal, they can't do everything over here; we must work together. So, we're insist... you know, we really can work in genuine partnership on this. We're making some progress, errm... let's see how it comes over the next few months. Nicky Campbell: If you'd been involved at the outset, do you think we might have got further with this investigation? Sir Bernard Hogan-Howe: Errr... I think that's a bit unf... that would be unfair. I mean there's been inquiries in, errm... in the UK, where we know that the police could have done better. I think to be too judgmental in these cases is... is wrong and I wasn't there and I'm not going to judge them. The main thing we're all committed to is trying to find that little girl. Nicky Campbell: And you have lines of inquiry, you have 'suspects' lines of inquiry; you have names. Sir Bernard Hogan-Howe: That's right. Nicky Campbell: Errm... and I appreciate how you can't, at this stage, go any further, errr... and have you spoken to those people? 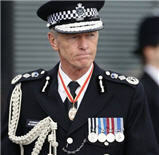 Sir Bernard Hogan-Howe: Errm... I'm not going to go any further, really. Because that's what you just said you didn't want! Nicky Campbell: I'm sure when you were interviewing people in that... in that little room you'd try and sneak one in like that, Sir Bernard. I bet you have in your time. The disappearance of Madeleine McCann is no different in that respect but of course the circumstances and the huge public interest, make this a unique case for us as police officers to deal with. 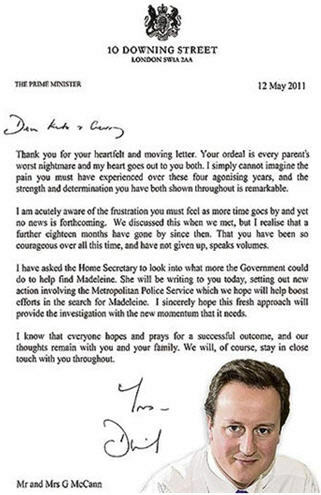 In a missing child inquiry every day is agony and an anniversary brings this into sharp focus. Our thoughts are with Madeleine's family at this time - as it is with any family in a missing person’s inquiry - and that drives our commitment to do everything we can for her. We don't have evidence telling us if Madeleine is alive or dead. It is a missing person’s inquiry but as a team we are realistic about what we might be dealing with - especially as months turn to years. The team has looked at in excess of 600 individuals who were identified as being potentially significant to the disappearance. In 2013 the team identified four individuals they declared to be suspects in the case. This led to interviews at a police station in Faro facilitated by the local Policia Judiciária and the search of a large area of wasteland which is close to Madeleine's apartment in Praia Da Luz. The enquiries did not find any evidence to further implicate the individuals in the disappearance and so they are no longer subject of further investigation. We will not comment on other parts of our investigation - it does not help the teams investigating to give a commentary on those aspects. I am pleased to say that our relationship with the Portuguese investigators is better than ever and this is paying dividends in the progress all of us are making. Of course we always want information and we can't rule out making new appeals if that is required. However, right now, new appeals or prompts to the public are not in the interest of what we are trying to achieve. Dan Lobb: Where are we at now with regards to ... the dialogue you have with the Portu ... Portuguese authorities - and how happy are you with the response you've got from, er, the request you have made? Andy Redwood: OK, well I am meeting now on a very regular basis - at least once a month - with a Portuguese counterpart in Porto - north-west Portugal - um, she leads a review team of officers who are committed, and dedicated to working with us, collaboratively, um, to establish what has happened to Madeleine McCann. Dan Lobb: Will they reopen the case? Redwood: Well the situation at the moment is ... is ... is ... is quite simple: we in the UK in terms of our relationship with Portugal, operate two completely different legal systems. And we acknowledge and respect that, and indeed, in terms of how the Portuguese operate is ... is ... it's the judicial authority that actually makes the decision around any re-opening. Dan Lobb: ... do you, and that's what you're pushing for? Redwood: Yes, absolutely ... 100%, the dialogue I have with my colleague in Portugal is very positive, and they do want to reopen in due course. Kate Garraway: We've heard mention of these 195 'investigative opportunities'. Kate Garraway: What does that - what does that mean, does that mean - leads? - chances? - of finding Madeleine? Kate Garraway: Basically tying together - links. Redwood: ... in the United Kingdom, which is where our really important dialogue with the Portuguese police takes place. Dan Lobb: Do you believe she is still alive? Redwood: I believe she's still alive because, at the beginning of this case ... it's a huge privilege for us at the Metropolitan Police to be part of this investigation ... er, investigation review. Is that we came with a completely open mind. Kate Garraway: So what are the things that make you think that ... because I think you know we're all clinging to the hope, aren't we? 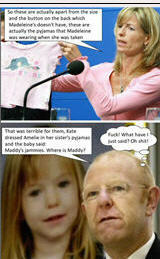 Redwood: Yes, I mean, you know, we have conducted a forensic analysis of the timeline, and there is clearly opportunity there - for Madeleine McCann to have been removed from that apartment alive - and it is our belief, as experienced investigators - on the evidence, that, um that you know, that that, that is as a criminal act - and that has been, you know, undertaken by by a stranger, and so from that - she's ... and there are other cases around the world, as you know where, many years later, people have been taken and been found alive. Dan Lobb: Very quickly, let's take, take another - another look at that picture that you guys have released - the age-progression picture, and in, in what ... what help this could possibly do to the investigation? As we were walking up from the beach at about 5pm, I had a call from Cherie Blair, in her final days as wife of the prime minister (her husband Tony would announce his resignation two days later and leave office the following month). She was kind and helpful. She told me it was amazing but encouraging that Madeleine was still the first topic on the news every night. This was only five days after the abduction: as it turned out, our poor daughter would continue to headline the bulletins for some time to come. Cherie also warned me, ‘Whatever happens, your life will never be the same again.’ She mentioned that a friend of hers, Catherine Meyer, was the founder of PACT – Parents and Abducted Children Together – and said she would get in touch with her on my behalf. Doubtless I asked Cherie if there was anything the British government could offer the Portuguese in the way of resources to assist or expedite the search for Madeleine. It wasn’t my intention to make her feel uncomfortable by asking this, and I’m sure I didn’t. We were just so desperate I couldn’t let the opportunity go by. I fully accept it is Cherry Picking. MR: And I know, Pedro, the senior Portuguese colleague I’ve worked with and his team, have a shared determination, to find an answer. That’s what we’re going to do. MR: We’ve got some thoughts on what we think the most likely explanations might be and we’re pursuing those. But I’m not going to tell you what they are. There WAS something worth looking at in detail . . . and we did ! MR: Where we are now is much narrower, much more focussed. = No there isn’t anyone we are looking FOR. We know all the players, and where they live. So some of the information received is interesting and needs more work and sifting ! MR: Until we get to the point where we have solved it, we’re unlikely to have definitive evidence as to exactly what happened at the time. All the hypothesises that you or I could come up with, they all have to remain open and the key lines of enquiry open today focus on one or two of those areas but we have to keep them all open until we get to that critical piece of evidence that narrows it down and helps us to be more confident as to exactly what has happened on the day Maddie went missing. = We don’t accept the official story as to what happened. MR: Ourselves and the Portuguese are doing a critical piece of work and we don’t want to spoil it by putting titbits out on it publicly. And note this use or words . . .
MR: However she left that apartment, she has been abducted. Can the word be used for the removal of a body ? Yes, it can be and is, but for obvious reasons (I hope) I do not want to give the full quotes here. Detective Chief Inspector Andy Redwood had said the assumption that Madeleine had been alive when she left the apartment "may not follow with all our thinking" on the case. To clarify: those quoted words actually came after Redwood had referred to the assumption that Madeleine had been abducted. However, Redwood did say during the same press conference that police were considering the possibility that Madeleine was not alive when taken from the apartment as well as the possibility that she was. Which really rubbed it in ! So, to precis, Operation Grange still a facade, still ruling out the McCanns and still considering it an abduction by a third party. It may turn on a question of interpretation. @Hobs wrote: MR: And I know, Pedro, the senior Portuguese colleague I’ve worked with and his team, have a shared determination, to find an answer. That’s what we’re going to do. Then with a fine sprinkle of"Fairy Dust",they all lived happily,the now official Operation Grange prose to close operation down by who ever has the poisoned chalice as Head of the Met? Metropolitan Police Service wrote: As you would expect the MPS will not provide a running commentary on live investigations.